Katy says: In the past few months, the Venezuelan government has dramatically increased its threats against private health-care providers, repeatedly attacking them for “fleecing” the public and for illegally jacking up prices. Hardly a day goes by without a new threat being hurled at private health-care, doctors or insurance companies. At the same time, the government curiously reiterates something few people believe – that it does not want to eliminate private medicine. “We have to reach that point and I am willing to reach it,” Chávez stressed, saying that he does not wish to “eliminate” private medicine in the middle of a speech marking the inauguration of a hospital ward named after someone who thought it necessary. 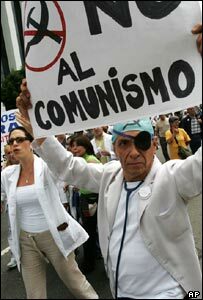 Dictionary.com lists one of the definitions of populism as “any of various, often anti-establishment or anti-intellectual political movements or philosophies that offer unorthodox solutions or policies and appeal to the common person rather than according with traditional party or partisan ideologies.” This definition fits Chavez’s vision of health care to a T.
Private clinics are in the business of providing a service called “health care,” and resources will only flow towards that activity if investors see a return to their investment. The only way this can happen – the only way private health care can even exist – is if people pay for the service they receive, be it via their insurance, the state or their own pockets. Charging for health care is a necessary condition for having private health care, and most of us would agree that private health care is better than no care at all. Still, there is something about denying health care to people who can’t pay that just seems unethical. At this point, nobody serious believes the government’s agenda toward health-care is anything but ideological. Sure, the government has invested in primary care, and it has recently opened new facilities that give the appearance that we are moving forward. Yet, as we have pointed out before, investment in infrastructure has not yet translated into improved health indicators, and the gains we have had fall short of the money apparently being invested. Health indicators do not suggest any significant departure from the trends they carried prior to Chávez. Only hard-core chavistas and their foreign pamphleteers would confuse a couple of shiny new hospitals with actual health-care policy that delivers, whose results can be assessed and audited. What these “common men” don’t understand is that there is more to public policy than simply writing checks and cutting ribbons. The notion of cost-benefit analysis or thinking about the medium- and long-term financing aspects of providing affordable health-care to millions of Venezuelans is as foreign to PSFs as a Reina Pepeada. Health-care in Venezuela simply cannot be sustained through the State alone. A government focused on results rather than rhetoric would keep this in mind and act accordingly. A government interested in improving access, yet conscious of the importance of private providers, would understand that being denied service at the door is caused by either clinics’ inability to charge people *after* they have received service, or by people’s absolute inability to pay. Any serious government would look to attack one or both of these root causes. A results-oriented government could sit down with private health-care providers and suggest “good practice” guidelines to ensure that patients first receive care and then billing issues are addressed. It could push for a “patients bill of rights”. It could offer to pay for the private provision of health care for poor Venezuelans through some sort of voucher scheme, allowing people to choose whether to go to private or public hospitals. But these kinds of policies are too boring for the current administration, and working with the private sector to solve a problem that affects us all is something they are genetically unable to do. Instead, we get threats. Clinics will now have to accept anyone coming to get treatment, and the few patients with resources will end up paying most of the bill. Adverse incentives will run amok, raising the cost of private health care. But the government has already hinted it will not tolerate price increases. In the end, the government isn’t out to ban private health care, it’s out to bankrupt it. Private clinics will be expropriated without compensation. Before long, we will have an exclusively state-run health care system for 30 million Venezuelans. Anyone who thinks the system can survive with oil below $45 a barrel – if not sooner – has never been to a public hospital in Venezuela. Chavez’s big-oil policy style is typical of the way military caudillos usually handle things. His ham-fisted, yes-sir approach to complex social problems puts the “tank” in “think-tank.” It’s our loss that nobody bothers with the “think” part.